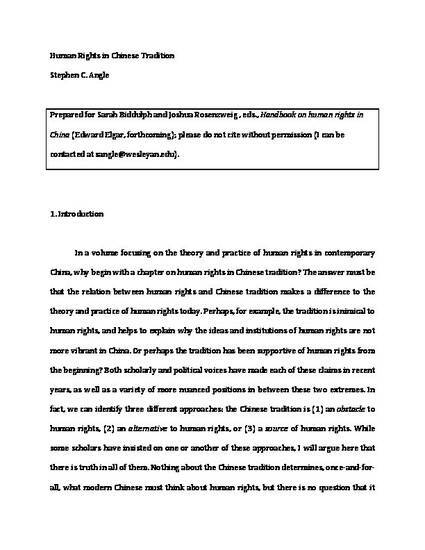 This chapter -- prepared for Sarah Biddulph and Joshua Rosenzweig , eds., Handbook on human rights in China (Edward Elgar, forthcoming) -- examines three different approaches: the Chinese tradition is (1) an obstacle to human rights, (2) an alternative to human rights, or (3) a source of human rights. While some scholars have insisted on one or another of these approaches, I will argue here that there is truth in all of them. Nothing about the Chinese tradition determines, once-and-for-all, what modern Chinese must think about human rights, but there is no question that it has had, and will continue to have, varying kinds of influences on people today. The task of this chapter is to explain the senses in which (1) through (3) are all correct.